You may remember Goat Simulator from the last time you chuckled at one of its expansion trailers. That time it was taking a pop at MMOs; this time, it's survival games. Coffee Stain Studios has announced GoatZ*, a survival-themed DLC add-on that will be released this Thursday, May 7. *If you don't get the reference, please cherish your innocence. 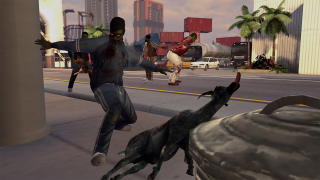 Goat Simulator: GoatZ will cost $5.